My name is Silvia Zane, I am a Reader in Astrophysics at the MSSL. My research spans several fields in high energy astrophysics, but today I wish to talk to you about some truly spectacular stars, called “neutron stars“. Neutron stars (as black holes) are the final products of the stellar evolution of very massive stars. When massive stars (those about >10 times heavier than our Sun) end their life, they make a gigantic explosion, called a supernova, and leave behind a compact remnant. This compact remnant can be either a neutron star or a black hole. To be more precise, stars that have about 20 times the mass of our Sun end as neutron stars. And stars with mass greater than 20 times the Sun’s dont have a choice to survive, and they collapse into a single point, which we call a black hole. As you have realized, neutron stars are the most compact stars which are still “visible”. Neutron stars have a mass comparable to that of our Sun packed in a sphere about 10 km in radius. The matter in their interior is as dense as an atomic nucleus: indeed, neutron stars are the densest objects known in the present Universe. They are also embedded with the strongest known magnetic fields, typically several million times that of a common, hand-held magnet. This large magnetic field, coupled to the star rotation, results in the emission of collimated beams of radio waves which at regular intervals sweep the Earth. 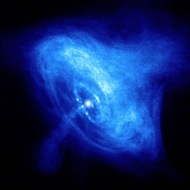 This produces the most common observational manifestation of a neutron star: a radio-pulsar. A movie demonstrating the beaming of a pulsars jet. Since in their interior the matter reaches a density larger than the atomic one, the study of neutron stars structure provides a unique way to probe the properties of matter under conditions which will be never accessible to ground-based experiments! Conditions so extreme that are not to be found in other astrophysical settings. Study of neutron stars holds the key to answer such fundamental questions as if the ground state of matter is made of hadrons or of free quarks. Among the neutron stars, there is an even more peculiar class that we call “magnetars” (which stands for “magnetic stars”). They have been discovered in the last two decades, thanks to observations at X-/gamma-ray energies. Magnetars are X-ray pulsars with periods of a few seconds and are characterized by the emission of tons of short, strong bursts. Three of them emitted, once in their life, a hyper-energetic giant flare which was the strongest transient phenomena ever detected in our Galaxy. Unlike a normal radiopulsar, whose rotation powers the lighthouse-like radio emission and X-ray pulse, a magnetar’s emission is powered by its decaying magnetic field, which can be as strong as 1014-1015 G (this is in units of Gauss; a normal iron fridge magnet has a strength of about 100 G). This is about 100-1000 times more intense than in “ordinary” neutron stars, and about 100 million times more powerful than the strongest man-made magnet, and 1000000000000 times stronger than a fridge magnet! This is so strong that if there was a magnetar half the Moon’s distance away from Earth, it would wipe the magnetic strips of every credit card on the planet. Interestingly for the theoreticians, this field strength is in excess of what we called the quantum critical field, BQ = 4.4×1013 G, above which several quantum effects become observable! Therefore magnetar studies promise to test quantum-electrodynamics in the strong-field regime, so, once again, to push our knowledge of basic physics exploring conditions not reproducible at Earth! But now the question is: how do we know that those magnetic fields are there? How do we measure the magnetic field of these stars? The standard technique is to measure the external dipolar component, which is the one in the field lines that extend to a large scale from the star. The strength of this dipolar field is accessible via timing measurements, because it is related to the value to two measurable quantities: a) the rotational speed of the neutron star and b) its deceleration. A dipole is a very simple magnetic configuration, that looks much as a magnetic bar. 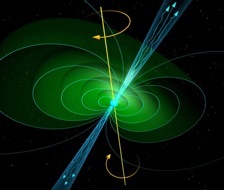 However, scientists have always suspected that, in particular in magnetars, the magnetic structure must be much more complex, with several loops and twisting of the field lines. A few years ago, a very enigmatic source, called SGR 0418+5729, has been discovered. This neutron star showed the characteristic X-ray outbursts and flares which are typical of magnetars, but it had an exceptionally low dipolar magnetic field – about two orders of magnitude lower than that of the other magnetars. Since it otherwise behaved like a magnetar, scientists were tempted to claim that SGR 0418+5729 was indeed a magnetar. In our team, we came to the conclusion that its outbursting activity could be powered by a much stronger component of its magnetic field, twisted and hidden in the star interior. Finally, we have just found evidence of this! We have discovered that the star had been concealing, in its interior, a very strong magnetic field (actually, this field is as large as ~1E15 Gauss, it is the strongest ever observed in the Universe!) that it is leaking, through a small-scale magnetic structure, from the interior to the star surface. This is the first time that the magnetic field in a small spot at the surface of a magnetar could be measured. We discovered this little magnetic loop because we searched for very subtle effects and used a new technique to analyse the X-ray data from this source. 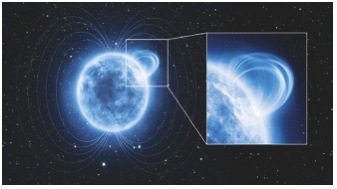 We studied how the magnetar’s X-ray emission varied at different energies and, at the same time, as a function of the star’s rotational period and searched for possible changes in the emission that are localised to smaller portions of the magnetar’s surface. The data have been taken with XMM-Newton, a mission which is a major flagship of the European Science Agency (and to which construction and design our MSSL has heavily contributed!). The result was surprising: we remained speachless when we realized that, at regular intervals, the magnetar’s emission declined, and only at certain energies! SGR 0418+5279 rotates every 9 seconds. What we discovered is that the magnetar’s emission between 1 and 5 keV dops sharply, and it does this only at certain moments during our observation of the rotating star. 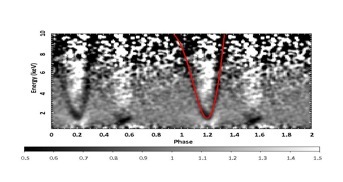 This can be seen in the graph as a dark V-shaped area around the orbital phase of 0.2; the same V-shaped feature is showed again around 1.2. The fact that the decrease in emission took place only at a certain rotational phases is a clear indication that there are some particles, located in a well confinded region of the star surface, that absorb the X-rays released by the magnetar. This is consistent with the presence of a small magnetic loop of field lines: the protons can be confined very efficiently by a strong, localised magnetic field emerging from the magnetar’s interior. The absorption phenomenon, called cyclotron absorption, is caused by these protons that interact with the X-rays emitted by the magnetar. The fact that the dimming happen at energies between 1 and 5 keV, depends on the specific intensity of the magnetic field along this little loop, so this allowed us to measure the field strenght. This energy dependence of cyclotron absorption on the value of the magnetic field produces the V-shaped pattern that can be seen in the graph. The data show that magnetic loop extends only to a few hundred metres across the surface – so, it is quite small, considering that the diameter of a magnetar’s is about 20 km. The magnetic field lines are probably shaped like a series of adjacent arcs, resembling the appearance of loops on the surface of the Sun, and they are highly twisted and curved so that they are able to trap a larger than average concentration of particles in such a small space (and effect called `magnetic confinement`). The difference in the magnetic field value outside and inside the little loop is more than one thousand: this is why the detection is so clear and the effect of the strong field localised in the small patch stood out clearly against its weak background. What is the implication of such discovery, at large? This kind of news tells us that several other pulsars, that look relatively mild and quiet at a first glance, might conceal such a strong magnetic field in their interior without displaying it as a strong dipole field! Indeed, there are magnetic monsters in our Galaxy: in principle, all pulsars may switch on and become magnetars for a while and start emitting giant flares of X-rays and gamma rays! a) it affects the modeling of SN explosions: a larger-than-thought number of strongly magnetized neutron stars calls for a revision of a key ingredient of the NS formation model. An extreme internal field should then be a common place rather than an exception. b) It affects our expectation for detecting gravitational wave (GW) radiation from newly born magnetars: the GW background radiation produced by the formation of highly magnetic neutron stars is probably underestimated, given this new result. c) It affects our interpretation of Gamma-ray bursts: if a large fraction of the formed neutron stars have a strong magnetic field, hence GRBs due to the formation of such stars are way more frequent than predicted. d) It affects our prediction on the number of Massive Stars in our Galaxy: if strong-B neutron stars are formed by the explosion of highly magnetic stars, there should be many more of such stars than predicted thus far..
What’s more? Stay tuned ! These are just a few considerations, we do not know what these enigmatic neutron stars will do next time and which new surprises they will bring to us!